The objective is to introduce agility in the RF communications circuits and systems to reduce the system size and/or increase the functionalities while maintaining low power consumption and minimum losses. We started this activity in 1998 studying micro-switches (capacitive and resistive contact), following by ferroelectric material (2007) and microfluidics (2007). Intensive technological developments have been performed in order to provide internal RF-MEMS technology which includes both capacitive and resistive switches. Although considered as a low TRL process (stabilization and tolerance control out of scope in this study) it has been instrumental to carry out a systematic investigation of the failure mechanisms from device down to the material level. Next step has been to invest this body of knowledge in the design and modeling of more advanced modules and circuits (absorptive switches, SPDT, switching matrices, phase shifters) by exploiting higher TRL technology such as CEA-LETI (Grenoble) dedicated MEMS process and the IHP (Germany) MEMS on BEOL SiGe pilot line. These studies have been targeting space application and supported by ESA and TAS-F. Worth of note is the achievement of a very accurate and large band (DC to 120GHz) lumped element model for the IHP RF-MEMS which has enabled on the one hand the design of original devices like the 40 GHz absorptive SPDT redundancy switch and on the other the possibility to carry out real time yield control of the technology obtained by introducing the process tolerances in the electrical lumped element model. Thanks to these results IHP has been able to enlarge the existing component library and to carry out process control and optimization which resulted in improved reliability. An important studies done concern the reliability studies on capacitive and resistive micro-switches in the framework of International (EDA-POLYNOE 01-2008/12-2010), National (ANR-FAME 01-2008/06-2011) and Regional (STAE-SYMIAE 01-2008/12-2010) projects. In micro-switches, mechanical contact between movable free thin film and electrode (dielectric or metallic) is performed under very weak forces (below 1mN) and the surfaces roughness affect then the contact quality. The nano-scale roughness description is then necessary to understand the failure mechanisms of these components. The main results have been obtained on nano-scale characterization of dielectric charging under high electric field generally used for the micro-switch actuation. LAAS was one of the first labs in the word introducing AFM tool for both charge injection and charge evaluation versus time through the AFM tip (Fig1.1) . These studies allowed the identification of the keys parameters that govern the dielectric charging, including the influence of the environment (humidity, gas, ..) and the coupling between electrostatic forces and the formation of the water meniscus at asperities. These works have been performed in collaboration with Prof. Bhushan, head of “Nanoprobe Laboratory for Bio- and Nanotechnology & Biomimetics” (Ohio State University) and with Prof. Papaiooannou from NKUA University (Athens). More than 10 publications have been published in International Conference and 10 in International Journals. One of these publications has been selected for the coverage of “Journal of Colloid and Interface Science” in 2011. Finally the study on ferroelectric materials has allowed to explore a completely different approach toward frequency agility. In particular innovative and state of the art implementations of doped Barium-Strontium-Titanate (BST) based thin dielectrics with record low losses (tan-delta <1.5% @10GHz) have been carried in collaboration with leading laboratory in the field of material synthesis (CNRS-ICMCB -Bordeaux) and a major industrial processing and integration provider (ST-Microelectrionics -Tours) in the framework of ANR-ABSYS2 (Jan 2011-June 2014) project . These material can provide extremely high tuning range (>70% @10GHz) with permittivity ranging from 100 to 400 at 15V and 0V respectively. Thanks to these superior features LAAS has been demonstrating variable capacitor showing a measured tunability of 72% under 0-15 V bias (Fig1.2) and tunable filter featuring a tuning of 88% (657 MHz-1235 MHz) of the filter center frequency and an almost constant fractional bandwidth of 30% upon the application of a 0-15 V bias (Fig1.3). The insertion loss is between 5.8 and 3.2 dB, and the return loss is better than 9 dB. These very promising performances open the way to reconfigurable circuits up into the millimeter band, which represent the focus of future activities in this area. Reduction of antennas size, while remaining high radiation performances, is a crucial challenge in a lot of wireless communication systems to improve the integration capabilities. In our research work, highly irregular, space-filling or folded patterns are found for designing innovative small antennas with high radiation efficiency. These patterns have been specifically applied to helical antennas, spiral antennas, retrodirective antenna sensors and beam forming Networks of multibeam antennas. Helical antennas are extensively used for their naturally pure circular polarization as it avoids polarization tracking. This property is particularly interesting in satellite systems as a fluctuating ionosphere phenomenon, known as Faraday effect or Faraday rotation, impacts the orientation of linear polarization. Although these antennas are now known for more than sixty years, there is still a lot of research work and patent publications in this specific area especially on the height reduction of helical antennas. A single sinusoidal pattern (Fig 2.1.a). The size reduction obtained is close to 50% without significant degradation of the cross-polarization level (Patent WO 2008/142099). A superposition of sinusoidal patterns (Fig 2.1.b). The size reduction is between 48% and 72% without a significant degradation of the radiation diagram, directivity and polarization purity (Patent WO 2009/034125). Spiral antennas are particularly used in wide band applications as its offer a good comprise between size and performances with also the advantage of circular polarisation. The main challenge in UHF-VHF applications is to reduce the lowest operating frequency while keeping constant the antenna size. In 2012 we have proposed a compact wideband spiral antennas by stacking, below the antenna plane, resonant metallic rings with highly irregular and space-filling contours. The electromagnetic coupling between the antenna and the resonant ring allows significantly reducing (up to 30%) of the lowest operating frequency of the spiral antenna while keeping constant the antenna size (Patent WO 2013/121118). Retro-directive antennas (Van Atta reflector array), due to their self-steering capability, present an excellent candidate for passive antenna sensors with robust performance under a wide range of reader-sensor orientation scenarios. However few implementations can be found in literature addressing compact and multiband retro-directive antenna that offer broader readability band for RFID technology. In 2013, we reported the first millimeter-wave passive Van Atta retro-directive antenna array with enhanced Radar Cross Section (RCS) using Substrate Integrated Waveguide (SIW) technology (Fig 2.1.d). The double-layer configuration is exploited to obtain a more compact design while providing the same re-radiated pattern of the corresponding single layer configuration. Measured results have shown more than 10 dB enhancement in the monostatic RCS of the passive retrodirective tag over an angle of ±60° from boresight, compared with the equal-size reference rectangular metallic sheet. 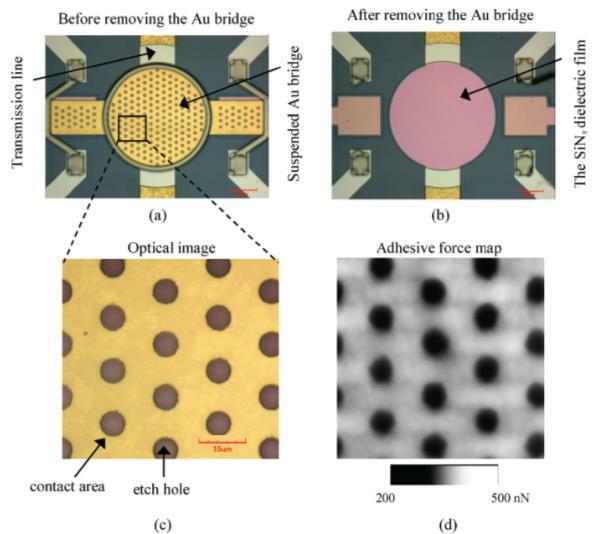 In collaboration with Georgia Tech, Atlanta, USA (Prof. Manos Tentzeris) we have also reported the first dual-band (3.6GHz / 5.8GHz) retrodirective reflector array using SIW and inkjet-printed technologies on flexible low-cost substrates (Fig 2.1.e). The design can be easily scaled up to millimeter-wave frequencies offering additional advantages for compact circuit topologies and larger array size. Multibeam antennas (MBA) have become a key element in nowadays wireless communication systems where increased channel capacity, improved transmission quality with minimum interference and multipath phenomena are severe design constraints. In order to reduce the number of reflectors associated with MBA in communication satellites Multiple Feed per Beam (MFB) focal arrays are good candidates. In MFB focal arrays, each beam is produced by a cluster of feed horns illuminating a parabolic reflector which are fed by an appropriate Beam-Forming Network (BFN). From the overlap of adjacent clusters the radiating surface is enlarged without increasing the beam spacing. Moreover MFB focal arrays allow producing spots using a single reflector and consequently, only two antennas are generally required, one for transmitting data and one for the reception. Since the early 1960’s, different solutions have been proposed for designing of the BFN for feeding the multi-beam antennas, such as Blass matrix, Nolen matrix, Rotman lens and Butler matrix. Among these matrices, the Butler matrix has received particular attention in literature as it is theoretically lossless and employs the minimum number of components to generate a given set of orthogonal beams. However, the Butler matrix has a main design problem which is the presence of path crossings. The objective of our research work is to propose new passive devices (such as couplers, phase shifters and transitions) allowing the design of very compact Beam-Forming Network for multibeam antennas. We have designed and measured an original compact BFN for feeding a Ka-Band multiple feed per beam focal array. This BFN is composed of tri-dimensional interleaved couplers made of circular waveguides and interconnected by thin radial rectangular waveguides (Fig 2.2.a). Three adjacent clusters of the focal array overlap for enhancing the illumination performance within the size-constrained array lattice (Fig 2.2.b, Fig 2.2.c). The realized gain (15dB) is higher than the gain provided by the Single Feed per Beam (SFB) focal array having analogous size. Substrate Integrated Waveguide (SIW) technology have been chosen for designing compact broadband coupler. This technology features interesting advantages, such as, high Q factor, high power handling capability while being compatible with PCB and LTCC technologies. However, when compared with planar transmission lines, SIW appears relatively larger, due to the fact that, the SIW width is related to the dominant mode cutoff frequency. We have proposed new topologies for reducing the size of SIW couplers and consequently, for designing original and compact Butler matrix for multi-beam planar antennas with performances higher than state of the art. We proposed the first wideband two-layer Half-Mode Substrate Integrated Waveguide (HMSIW) topology where coupling takes place through a set of narrow, symmetrical, offset slots, which feature a flexible design providing a wide coupling dynamic range with wideband characteristics and super compact topology. Butler matrix prototypes have been validated with isolation characteristics better than -15 dB and with input reflection levels lower than -12 dB over 24% frequency bandwidth centered at 12.5 GHz. Measured transmission magnitudes and phases exhibit good dispersive characteristics of 1dB, around an average value of -6.8 dB, and 10° with respect to the theoretical phase values, respectively, over the entire frequency band. Since 2006 MINC has engaged an original research program (FP6-AMICOM 2004-2008 and then LEA-SmartMEMS 2009-2011) aiming to explore the fundamental capabilities of carbon nanotubes (CNT) and graphene at microwave and millimetre waves. Most of the activity dealt directly with inkjet printed randomly distributed CNT or “ordered” CNTs (fabrication by external companies through controlled CVD growth on silicon substrate), for the miniaturization and enhancement of basic RF functionalities (interconnections, detector, filters, phase shifters, …). The MINC research focus was moved then to an emerging carbon based material such as the grapheme (FP7-NANORF 2012-2015). Being flat, hence more compatible with conventional planar technologies, and commercial availability, it provided a very fertile ground for experimental investigation. The focus on graphene for microwave (and more generally RF) application was the original aspect of the research at LAAS back in 2010, since most of the interest worldwide was rather devoted to the DC and the optical properties. The main challenges, beside the technology maturity (processes accuracy and material quality are currently limited and need to be improved) are the wise exploitation of the properties demonstrated at nanometric scale to develop functional RF devices. A critical issue in this sense is that individual nanostructures have very high impedance (~KOhm ) which intrinsically translates in a severe RF mismatch, possibly solved by collective use of single nanostructure. The activities carried out at LAAS on graphene focused essentially on three topics: i) the transport at the metal-graphene contact interface, ii) the transport mechanisms (diffusive vs ballistic) within the graphene and from DC to millimeterwave, iii) the effect on transport due to surrounding material (dielectric). These three aspects represent the major challenges for the development of graphene based devices. They moreover pave the way toward the exploitation of attractive and unique properties such as the ballistic transport (which yield low losses and high speed electronics), occurring in graphene at ambient temperature. This capability has been explored to demonstrate an original Y- Branch Junctions zero bias detector, successfully working with signals up to 50GHz with a maximum response at 10GHz (the device is theoretically capable to work in the THz range). The response measured at room temperature show a linear response in the measured power range (-40dBm / 0dBm) and a sensitivity as high as 10 Volts/Watt of input power (Fig 3). Another innovative application are Ratchet effect based detectors demonstrated in the past for 2DEG requiring III-V materials and currently being investigated for the first time at LAAS with graphene based structures at ambient temperature. Nowadays global electromagnetic simulators are indispensable for accurate predictions of the overall electromagnetic performances of radiofrequency systems. When it involves both large structures (in terms of wavelength) and ﬁne details the system or structure is said multi-scale or complex. The higher the number of scale levels the higher complexity. We develop two original approaches for the rigorous electromagnetic simulation of such complex structures: (1) the Scale Changing Technique and (2) the Grid Computing. These two approaches are a very fast technique and this makes them very powerful investigation, design and optimization tools for engineers who design complex circuits and systems. Well-known examples of multi-scale structures are provided by multi-band frequency-selective surfaces, ﬁnite-size arrays of non-identical cells and fractal planar objects. The electromagnetic simulation of these structures by meshing-based techniques (e.g., Finite Element Method, Finite Diﬀerence Time-Domain method or Transmission Line Matrix method) requires prohibitive execution time and memory resources. The numerical techniques based on spectral discretization (e.g., Mode Matching Technique, Integral Equation-Method developed in the spectral domain) share the same numerical limitations but, in addition, provide densely populated matrices with poor condition number and suﬀer from numerical convergence problems when applying to multi-scale structures. Recently, promising improvements of the Method of Moments have been proposed for reducing the execution time and memory storage for large-scale structures — see, e.g., the impedance matrix localization, the pre-corrected Fast Fourier Transform, the Fast Multipole Method and the Generalized Sparse Matrix Reduction Technique. However the convergence of numerical results remains delicate to reach systematically for non-expert users. The Characteristic Basis Method of Moment has been proposed for solving numerical problems generated by the electromagnetic simulation of multi-scale objects but, the construction of Characteristic Basis Functions for expanding the unknown current on such objects may be very time consuming and may require in practice large memory storage capabilities. Finally the electromagnetic simulation of multi-scale structures may also be performed by the combination or hybridization of various numerical techniques, each technique being the most appropriate for each particular scale level. However such coupling between heterogeneous formulations or the interconnection of various simulation tools is very delicate in practice. In order to overcome the above-mentioned theoretical and practical diﬃculties, an original monolithic (unique) formulation for the electromagnetic modelling of multi-scale planar structures, called the Scale Changing Technique, has been proposed by LAAS. This new technique consists of interconnecting Scale-Changing Networks, each network models the electromagnetic coupling between adjacent scale levels. The cascade of Scale Changing Networks allows the global electromagnetic simulation of multi-scale structures, from the smallest to the highest scale. Multi-modal sources, called Scale-Changing Sources, are artiﬁcially incorporated at all scale levels for the derivation of the network. When the complex surface presents both large regions and ﬁne details –but no structures at intermediary scale levels–, mono-modal sources are able to model the electromagnetic coupling between the disparate scale levels. However, for objects involving multiple structures whose size covers a large range of scale, mono- modal sources fail to provide accurate numerical results while the Scale-Changing Sources allow the modelling of the scale crossing from the smallest to the highest scale (the number of modes in these sources can be derived from numerical convergence criteria). The global electromagnetic simulation of multi-scale structures via the cascade of Scale Changing Networks has been applied with success to the design and electromagnetic simulation of speciﬁc planar structures such as reconﬁgurable phase-shifters, multi-frequency selective surfaces, discrete self-similar (pre-fractal) scatterers and patch antennas. In the context of Information Communications Technology (ICT), the RF-designers, taking care of the link budget, are very often asked to model the presence of obstacles in the propagation channel. A numerical tool is then necessary for the rigorous calculation of the electromagnetic scattering phenomena inside very large (or oversized) structures (tunnels, airplane cockpit and fuselage), containing large electrical size and complex shapes. Conventional full-wave electromagnetic simulation require enormous amount of computational resources. We proposed a time-domain hybrid method based on computing domain decomposition (according to diakoptics procedure) for the rigorous calculation of the electromagnetic field inside a propagation channels with very large dimensions compared to the wavelength. As example, a large homogeneous tunnel (propagation channel) is discretized upon TLM-Symmetrical Condensed Nodes (SCNs). The termination is modelled by modal approach as a multi-port surface impedance. Since the electromagnetic modeling of such very large structure complex structures considered in the present communication is not accessible by means of traditional computational resources, the resolution is based on a Grid Computing (Grid5000 French platform.) A numerical approach, based on an asymptotic code and the PoWer Balance (PWB) method, to evaluate the high frequency coupling in a complex oversized structure has been applied. A hybrid numerical approach based on the coupling between TLM (for homogeneous volumes modeling) and mode-matching (for the planar structures modeling) has been developed and the results prove the beneﬁts of the Grid Computing environment to solve electrically large structures. Our study has highlighted the role of parallelization scheme, cluster versus grid, with respect to the size of the problem and its repartition. The analysis of the simulation performances has allowed to extract a priori practical rules for the estimation of the required resources for a given problem (prediction scheme). Another example deals with the simulation of electromagnetic propagation inside a plane cabin, taking into account all the seats (Fig 4). The simulation had those characteristics: frequency (3.7 GHz IEEE WLAN 802.11y-2008), Cell of 8 mm, 30869 time step, 1.6 billion of TLM cells, 360 seats, 226 Go of memory, 1320 cores on Grid’5000 (Lille, Nancy and Rennes, ... clusters) and 51 hours of simulation (estimated sequential time 1 year). The objective of the research we performed is to develop new technological solutions for low cost and portable reader systems allowing radio-localisation for different applications. The first topic concerns the ground water detection for geophysical studies, particularly in rugged environments such as the arctic, desert, uneven mountainous terrains or space and is performed in collaboration with Electronics Research Institute in Egypt (Project IRD-UWB/GPR 09-2011/08-2014). Typical readers are based on Ultra-Wide Band Frequency-Modulated Continuous-Wave (FMCW) Ground Penetrating Radars (GPR) that operate at low frequencies (<300MHz) to obtain penetration depths of at least several meters and a very wide sweep bandwidth to achieve submeter resolution for detailed subsurface images. They require complex architectures and bulky broad-band antennas. There is then a severe lack of low cost, flexible radar platforms providing the mechanical versatility that will be useful geophysical exploration. We proposed an original technological solution for conformal and miniaturized radar systems to be rolled up in a “poster-like” container (Fig 5.1.a) using additive printing technology (collaboration with Georgia Tech, Atlanta, USA, Prof. Manos Tentzeris). The full system is referred to as monolithic as lumped or distributed passives (hybrid coupler, matching baluns, filters and mixer), active devices (VCO, LNA and HPA) and the Rx/Tx antennas may share here the same flexible substrate in the proposed radar technology. The proof-of-concept system (Fig 5.1.b) performed the most fundamental operations of the FMCW radar including signal generation, as well as the amplification and correlation of the LO and RF signals for GPR frequencies. The simplicity as well as the multilayer/multimaterial capability of the proposed additive printing (fully printed passive, diodes, vias) combined with flexible mounting would enable the realization of highly dense interconnects as well as enhanced miniaturization and conformability of practical GPR systems of the future like wearable geodetection systems. The second topic concerns the indoor accurate localization of objects for two different applications : the first application deal with the localization (with few cm accuracy) of objects by a robot to offer memory assistance and search/carry services to people (Project ANR-CONTINT-RIDDLE 09-2012/08-2015 in collaboration with LAAS-RAP team) and the second application is about the localization (with few mm accuracy) of industrial parts for assembling (Project OSEO-SPHERE 01-2011/06/2014). Typical systems used are mainly based on Ultra Wide Band (UWB) technology or Frequency-Modulated Continuous-Wave (FMCW) Radar technique that involves high costs. The localization precision associated with the FMCW radar technique may reach the centimeter range in indoor environment while UWB systems allow achieving better precision but is a more expensive solution (precise clocks and Ultra-High-Speed Analog-to-Digital converters). The objective of our research is to obtain accurate in-door localization precision of tags by using a low-cost RF-systems. We have proposed a new simplified architecture for radiofrequency reader dedicated to the accurate measurement of distance between a reader in indoor environment (Fig 5.2.a) and an active/collaborative tag (Fig 5.2.b). It consists of applying a double windowing on the radiofrequency Local Oscillator signal of the reader. The measurement of the phase difference between the received signal VRF and transmitted signal VTX is performed by the means of an I/Q demodulator. From this difference the reader-to-transponder distance can be derived. The RF-signal transmitted by the reader consists of bursts of pulses that are generated by using a RF-switch SW1. Moreover, in order to adjust the duration of the windowing applied to the received signal, another RF-switch (SW2) is used. In conventional direct detection architecture, this second switch is placed at the LNA output giving undesirable spectrum spreading of the received RF-signal and then may render very challenging the design of the reader circuitry using low-cost components. We have proposed an alternative approach which consists of placing the switch at the output of the Local Oscillator. As far the base-band signal is concerned, the windowing can be indifferently applied to the Local Oscillator signal VLO or to the received RF-signal. However the windowing of VLO offers the advantage of avoiding the undesirable spectrum spreading on the received RF-signal and consequently, allows simplifying considerably the reader architecture and its cost. A proof-of-concept experiment at 5.8GHz has validated (1) the proposed double windowing principle applied on Local Oscillator signal and (2) theoretically predicted standard deviation associated to the multiplicative noise generated in the RF-reader. The estimation of the localization accuracy versus the duration of the measurement is underway. RF energy harvesting and Wireless Transfer Power (WPT) are very promising solutions that allow sensors, electronics and wireless smart systems to operate autonomous for energetic point of view. 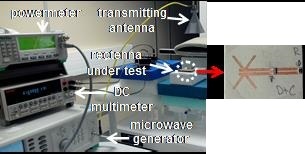 RF energy harvesting techniques are based on the harvesting/scavenging of an ambient RF energy source that is converted in DC using generally a rectenna (microwave rectifier mainly composed of a Schottky diode and a RC lowpass filter serially connected with an antenna through a matching network). 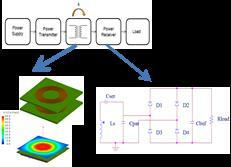 The major challenge is to provide high-efficiency design with an ultra-compact footprint and wide band behavior. Those requirements are more challenging for designs operating at high-frequencies (beyond of 10 GHz) as required by the new emergent applications: 5G and ISM 24 GHz band communication or satellite health monitoring. The studies performed at LAAS are focused on satellite health monitoring applications, by harvesting electromagnetic power available on the external body of broadcasting satellites. Due to the spill-over loss of broadcasting microwave antennas, some areas of the satellite’s external surface are illuminated by a strong electromagnetic field: 40 V/m in C-band (4-8GHz), 49.5 V/m in X-band (8-12GHz), 106 V/m in Ku-band (12-18GHz), 127 V/m in K-band (18-26.5GHz). This high frequency electromagnetic energy, unusual for terrestrial applications, is available as long as the data links are functional. The developed designs must provide a DC power in the range of few mW (DC voltage greater than 2V) for various frequencies in Ku and K-bands and for various polarizations (e.g. linear and circular) of the electromagnetic field that illuminate the satellite panels. It is a challenging goal and many drawbacks should be overcome: (i) the unavailability of accurate simulation models for the Schottky diodes working at such high frequencies, (ii) the thermal, mechanical and radiation safety requirements that are very restrictive for space applications, (iii) the maximization of the conversion efficiency (from DC to RF) for a non-optimal load of the rectifier element (Schottky diode) when a minimalist architecture of the rectenna is used (reliability maximization criterion). The development done up to now were focused on energy harvesting for satellite antenna working at 17.7GHz and for the powering of wireless resistive temperature sensors with a typical resistance in the range of 9–10 kΩ. Based on the electromagnetic maps of the available E-field, a simple rectenna design using only one Schottky diode has been fabricated validating that zero-bias Schottky diodes should be used for rectenna design working at low incident electromagnetic power (low-level E-field) while high frequency rectifier diodes perform better for moderate to high values of the incident power (Fig 6.1). More than 2 mW of DC power can be harvested using a high gain antenna (18.6 dBi). Wireless power transfer (WPT) techniques are very promising solutions for powering over distance cyber-physical objects such as smartphones or intelligent sensors. To implement a wireless powering system there are basically three approaches: reactive near-field coupling (inductive and resonant), far-field directive power beaming and far-field nondirective power transfer. Since 2011 several researches was started mainly concerning the reactive near-field coupling WPT. State-of-the art simulation models and design methodology was developed in collaboration with Continental Automotive SAS France for designing multi-functional inductive wireless power systems for automotive applications . The main challenge was to provide accurate and fast enough simulation models by integrating both electromagnetic and circuital simulation in a unique co-simulation methodology (Fig 6.2). These researches are performed in partnership with CNES and Thales Alenia Space since 2011 for RF energy harvesting part and in collaboration with Continental A1utomotive since 2010 for WPT activities. Since October 2013, Asoc. Prof. A. Takacs leads the new created working group WG 4.1 “Space Applications” within the COST action IC1301 WiPE (Wireless Power Transmission for Sustainable Electronics in order to push forward this very promising emergent research/application at European scale. Actives Wireless Sensors use a transmitter unit (integrated with the transducer) to transmit the information to the reader. Some products are already commercially available using micro-transducers, analog and RF integrated circuits and transmission protocols as Zigbee ,Wifi, Dash, …. A lot of research projects are performed to increase the performances of these systems but the majority of them are focused on existing technologies. These systems are limited today in numbers of real nodes able to be deployed and on their autonomy. Moreover, protocols like ZigBee, for example, address the case of communicating sensors from time to time; in that case the protocol is ( more or less) low power. The case of massively wireless communicating sensors in real time with need for synchronization like in the industrial test and measurements applications is not at all taken into account by that protocols and circuits. We are focused on the system and network development to be able to pass from some wireless communicating sensors to a real wireless sensors network. We proposed new approach from system and protocol point of view, co-developing software and hardware technologies in order to obtain reconfigurable physical layer upon the constraints applications and a reconfigurable MAC layer including new services like clock synchronization and localization, and later, beamforming algorithms. We developed an energy efficient (150mW for high data rate up to 500 Mbps which means an energy/bit of 0.3nJ/bit) wireless communicating node with precise synchronization (Fig.7). Reconfigurable, energy efficient PHY layer based on IR-UWB. The reconfigurability is a very important point, as we would like to answer a diversity of applications with one hardware and be optimal each time. We proposed a co-design approach from system to hardware for the optimal design and implementation of a radio layer interface based on IR-UWB. The concept of IR-UWB as a reconfigurable radio is exposed from its mostly digital radio behaviour. The data rate reconfigurability, the spectrum occupation reconfigurability and the radio range reconfigurability for IR-UWB transceivers are proposed. Reconfigurable IR-UWB transceivers are designed on FPGAs and ASICs. On the FPGA, 120Mbps reconfigurable IR-UWB transceiver was demonstrated. On ASIC, ultra low power, 1.4pJ/bit, IR-UWB emitter was designed, implemented and measured. Development of ultra low power, wideband 60GHz transceiver. Prototypes were designed in CMOS 65 nm for low power, low cost wireless communicating nodes. VHDL-AMS models were developed for a future SoC and/or SiP integration. MAC layer with new services like very precise clock synchronization (<1ns) and localization over wireless communication, in the case of a static wireless sensor network (no mobile nodes) which represents the majority of our applications. Flexible substrate heterogeneous integration potentialities for the complete wireless communicating nodes were studied and first results are very promising (losses lower than 1.1dB at 60GHz for flip-chip interconnections). WSN simulator for IR-UWB. The IR-UWB PHY layer was coded in the simulator and the main parameters of IR-UWB radio interface can be configured for each communicating node of the WSN. The best network topology for each application can be obtained. We participated to the European Flagship project “Guardian Angels of a Smarter Life”, that was pre-selected in 2011. We also coordinated a French Flagship project NANOINNOV-NANOCOM (09-2009/06-2011) on “Networks of reconfigurable communicating Nano-objects”. Internal collaborations with LAAS-ESE team that is focused on Energy Management are also in progress to develop integrated wireless sensor platform (Project CHIST-ERA-SMARTER 03-2013/02-2016). A strong collaboration started in 2013 with Prof. Florin UDREA, head of CMOS Sensors Group at Cambridge University in order to couple Sensors activities in Cambridge and Wireless Communication in MINC team. Two months long term visits have been performed in 2013 (Prof. Florin UDREA from Cambridge and Prof. Daniéla DRAGOMIRESCU from MINC) and Prof Daniéla DRAGOMIRESCU is invited in 2014 for an 8 months visit in University of Cambridge lab. For several applications (long life time, poor accessibility) energy autonomy is the main limiting factor for wireless sensor. This energy serves on the one hand for the sensitive sensor part (transducer, electronic processing) and secondly for the communication unit that connect the sensor to the reader. The lifetime of the sensor will depend on the amount of available energy and the consumption of the different parts of the sensor. To overcome this problem passive (without communication unit), battery less, wireless sensors are studied for many years (RFID sensors, SAW sensors). But the main drawback of this kind of sensors is their low interrogation distance (lower than 10m). In 2005 we started research on electromagnetic transducers with radar interrogation to overcome the limitations of classical passive sensors. 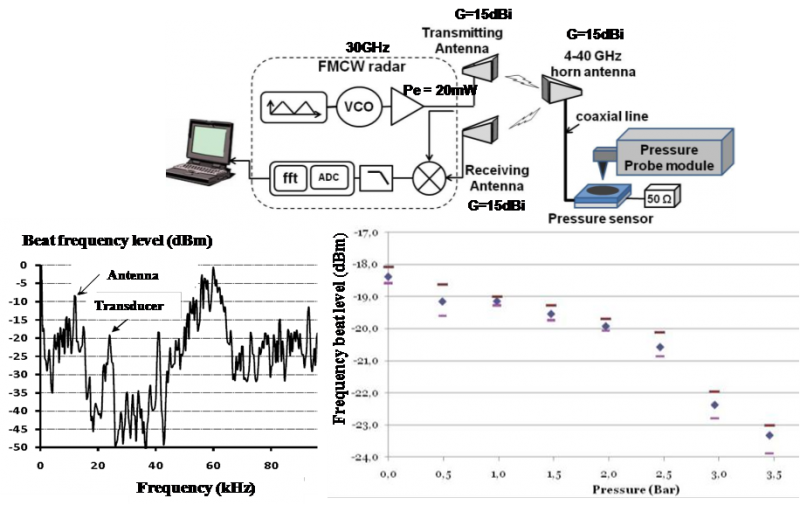 These sensors are based on the variation of a given electromagnetic wave descriptor by the quantity to measure and the remote sensing technique use mmwave Radar Cross Section (RCS) variability analysis. The main advantages of these new kind of passive sensors are : an unlimited energy autonomy, a full compatibility with harsh environment and higher interrogation distance (several ten of meters). A millimeter-wave carrier frequency for the Radar is preferred to a lower frequency because higher frequencies allow for reducing the sensor and antenna sizes and/or designing directional (high gain) antennas for beamforming, multi-beam (for increasing interrogation beam width) or beam-steering Radar reader. Moreover, higher frequency improves the sensor immunity to objects located at its vicinity by increasing the electrical length separation distance to them. Therefore, the antenna impedance matching will be not significantly modified by various outdoor or indoor environments. Additionally using millimeter-wave carrier frequency offers high bandwidth for higher range resolution and higher number of sensors identification. Electromagnetic transducers are mainly composed of a variable RF impedance or RF resonator connected to an antenna that can be interrogated through backscattered wave analysis. Several concepts are possible to realize a sensor with this kind of device by changing the size, the RF properties of a material constituting the device, the coupling between different parts of the device (using displacement of fluid or mechanical part). We investigated mainly the last solution that provides very high sensitivity and we developed transducers working generally at frequency of few ten of GHz. Membrane displacement has been used for the development of pressure, temperature, stress and radiation transducers. For pressure transducer a high resistivity silicon membrane is fabricated above a planar half-wavelength resonator deposited inside a few microns depth glass cavity. The membrane deflection leads to a modification of coupling between the silicon and the resonator evanescent wave that modifies the resonant frequency of the device. For resonator-membrane air gap lower than 10µm, the frequency shift is linear and can achieve sensitivity up to 5%/µm depending on the membrane thickness. We published the first world works on pressure sensor in 2007. The temperature transducer is based on split ring resonators in which each ring is closed by a variable capacitor formed by the metal ring and a bimorph micro-cantilever. The temperature shift will induce a cantilever deflection and then a capacitance modification that changes the resonant frequency of the device. For cantilever-ring distance lower than 10µm frequency shift up to 8%/µm can be obtained. The stress transducer is based on a patch antenna loaded with an open loop in two orthogonal sides in order to sense the stress independently in the two plane directions. Each loop is closed by a variable capacitor formed by the fixed part of the loop and the free end of a metallic cantilever. A substrate deformation causes a displacement of the anchoring point of the beam leading to a modification of the capacitor area and then changes the resonant frequency of the device. Sensitivity around 4.5ppm/μe can be obtained that are 4 times greater than existing strain transducers of the same class. The radiation transducer principle is based on polymer (High Density PolyEthylene) outgasing inside a micro-chamber etched in silicon wafer. The generated over-pressure leads to a silicon membrane deflection that modifies the resonant frequency of the RF resonator (see section on pressure transducer). The objective is to develop a wireless sensor for very high doses (10kGy/10 MGy). Tests structured have been designed and fabricated to validate the technology and the HDPE outgazing. Membrane deflections around 0.3µm/mgHDPE/kGy have been obtained for doses up to 40kGy. This membrane deflection will induce relative resonance frequency shift around 0.8%/µm (0.25%/kGy) for 10µm initial air gap and 400µm thick silicon membrane. This study is done in the framework of an ERANET-MNT project (DOSIMEMS 06-2012/05-2015) and it is the first time in the world that passive wireless sensor for radiation monitoring is presented. 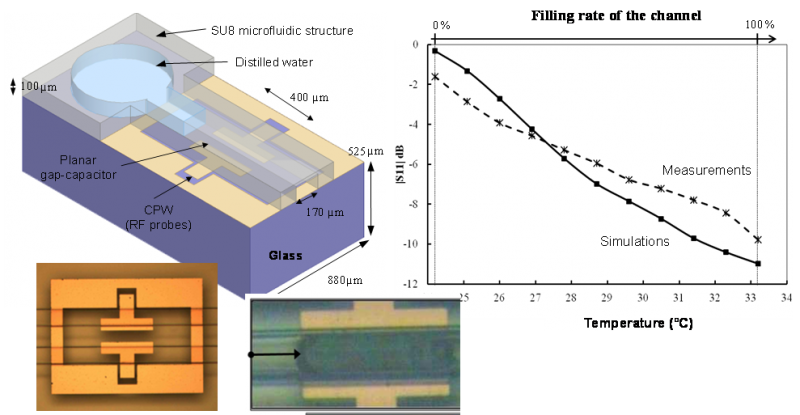 Temperature transducer principle using thermal dilatation of metallic or dielectric fluids in micro-channel has been validated for the first time in the world. The first one is based on lamda/2 dipole antenna array with progressive short circuiting of the two dipole strands by the metallic liquid when the temperature increase, leading to a drastically change of the antenna array Radar Cross Section (RCS) for each short-circuit. RCS variation around 12dBsm has been obtained for the full scale. The second one is based on coplanar gap capacitor whose value is modified by the progressively filling of gap capacitor with a dielectric fluid, leading to a modification of the scattering parameter S11. S11 shift around 8dB between empty and full channel has been obtained. FMCW (Frequency Modulated Continuous Wave) Radar has been chosen for the wireless interrogation of the electromagnetic transducers. This kind of Radar is simpler than UWB (Ultra Wide Band) Radar and is more compatible with high interrogation distance. FMCW radar is used to measure the RCS variation of the target that is done generally by the transducer connected to an antenna. The signal back-scattered by the target is mixed with the transmitted signal to obtained the beat frequency spectrum. By adding a delay line between the transducer and the antenna it is possible to separate the antenna echo from the transducer echo whose level varies with quantity to measure. This technique has been successfully applied to the wireless interrogation of the different transducers described previously and has been validated for interrogation distance up to 20m with 20mW input signal and 14dBi antennas. These results have been obtained without complicated signal treatment showing that interrogation distance of several ten of meters may be achievable with efficient noise filtering. The main drawbacks of this technique based on echo level are the low accuracy (around 10% of the full scale) and the sensitivity to parasitic signal attenuation that involves the use of reference sensor. But these drawbacks can be overcome with FCMW radar able to track the frequency for which the RCS is maximum. Specific delay lines are also used to create low frequency bar code for sensors identification. In this case, the beat frequency difference between the antenna echo and the transducer echo will provide the identification. We evaluated to 30 the number of different sensors that can be identified in a given direction by the same radar. In September 2009, we started a strong collaboration with ATHENA (Agile Technology for High-performances Electromagnetic Novel Applications) group headed by Prof. Manos TENTZERIS from Georgia Institute of Technology. This collaboration was strengthened in 2012 by a 12 months long term visit of Prof. Manos TENTZERIS at LAAS. Studies on stress and temperature transducers have been done in collaboration with Georgia Institute of Technology.